Manchester United stunned Leicester with two quick-fire goals before half-time from Henrikh Mkhitaryan and Zlatan Ibrahimovic. The Red Devils then piled more misery on the home side as Juan Mata made it 3-0 shortly after the restart. The result sees United return to winning ways and condemns Claudio Ranieri’s side to their fourth straight Premier League defeat. Mkhitaryan opened the scoring for Manchester United on 41 minutes, latching onto a flick header from Chris Smalling. The Armenia international burst away from the Leicester defence and powered a shot past Kasper Schmeichel and Wes Morgan into the top left-hand corner of the net. And United found themselves 2-0 up just seconds later as Leicester’s defence crumbled just before the half-time whistle. Antonio Valencia found Ibrahimovic in space in the box with a deft cut-back and the Swede made no mistake, firing home his 20th goal of the season. After the restart United picked up from where they left off and were 3-0 up on 48 minutes courtesy of Mata. 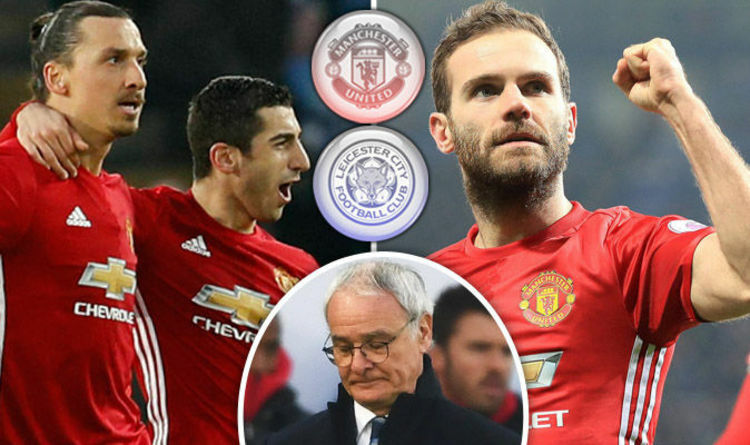 The Spaniard worked a clever one-two with Mkhitaryan to get in behind the Leicester defence and curl the ball past Schmeichel. The result extends United’s unbeaten run in the Premier League to 15 games and sees them move to within two points of the top four. Leicester meanwhile are in relegation form and the pressure is growing on Ranieri who has lost six of his last 10 league games. The Foxes are just one point clear of the relegation zone, with fellow strugglers Sunderland and Hull both winning this weekend.